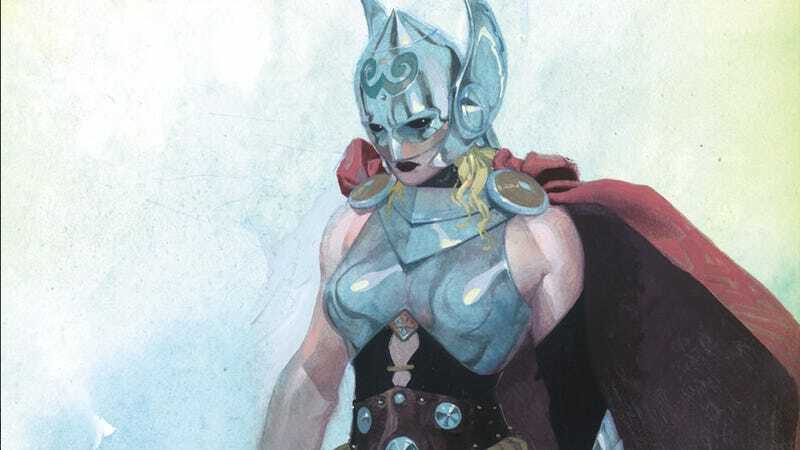 We still don't know who the identity of the new wielder of Mjolnir is, but thanks to Jason Aaron's Thor #5, we do know she has absolutely no patience for creeps who can't handle the idea of a goddess of thunder. Even if that creep happens to be the Absorbing Man. As you can see, Crusher "The Absorbing Man" Creel is pretty much echoing the arguments of many real-life jerks, who have filled the nerdenet's comment sections with all caps rants about how "feminists are ruining everything," including comic book superheroes. Something tells me writer Jason Aaron is addressing them just as much as Thor is addressing Creel. I eagerly await to see who jumps in to say "This guy has the right idea!" because, as if having the same gender politics as a comic book supervillain could ever possibly be construed as a good thing. I can only hope you guys use the hashtag "#NotAllAbsorbingMen" to identity yourself.